Orthodontic expansion is an opportunity to correct narrow upper jaws and provide long term stability to orthodontic treatment. Not every patient is a candidate for expansion. For those that are, rapid palatal expanders develop more room in the dental arch, alleviate crowding, and correct constricted upper arches. The proper use of this appliance when recommended can even help some patients avoid extractions or jaw surgery! Gentle incremental pressure is applied when the appliance is turned. 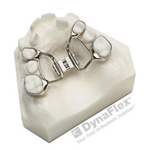 If an expander is used with your treatment plan, we will review when and how to turn the appliance. After active expansion is complete, the appliance will remain in for a period of time to prevent regression.